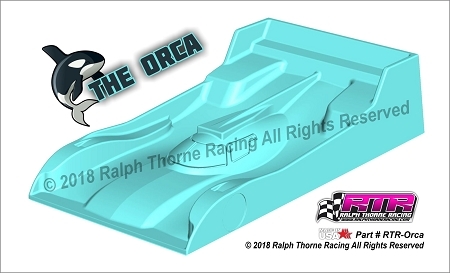 Home > Bodies > Orca LMP Body .007"
Ralph Thorne Racing proudly presents 'The Orca', our first 1/24 LMP style body that we are manufacturing in-house. It is based off of the highly successful 'Renegade' GTP body platform. It has recessed front wheel sticker locations just like all our other bodies that makes the front wheels easy to align on both sides, and they appear to be tucked under the front fenders. The body will measure just around 83 1/2 mm wide. We decided on this width to allow for proper fit and clearance on modern flexi style chassis. Once again we've added a nice cut line to assist in body trimming and mounting. The design was CAD drawn, as always. The rear of the body creates big time downforce, allowing you to decrease your laps times and turn more laps, plain and simple. Once again this is an original copyrighted design from Ralph Thorne Racing with all rights reserved. We don't back pour or copy any other manufacturers designs. They are available in .005", .007" and .010" thick Lexan. Each body comes with a unique window mask and a pair of front wheel stickers. Please note that we start from .005", .007" and 010" material, so it will be thinner on the sides. As always we strive for quality pulls with even side thickness. Retail price for .005" and .007" is $6.95 each plus shipping. Retail price for .010" is $7.95 each plus shipping. Please note the bodies will only come in retail packaging when purchased by a raceway or if specifically requested on direct orders. Titan COT Stock Car Body .007"
Titan COT Stock Car Body .010"